“What is really being recognized here is not a singular person, more so than a concept and a series of disciplines,” said Ryan Bretsch. “[The Atomic Revenue team] is all in this together. Companies are slowly starting to recognize in St. Louis, and beyond, the value of having this unique application to their marketing, sales and customer operations effort. Yes, I will be standing to accept this award. But make no mistake, this recognition is really for our combined efforts at Atomic Revenue; on the team’s efforts, in serving our customers and St. Louis.”The “Top 100 People To Know Luncheon” annually honors the area’s “Top 100 People To Know in St. Louis to Succeed In Business” as voted on by a group of selected judges. The luncheon will feature the highly regarded Speaker and Performance Coach Ben Newman, with honorees awarded before a group of outstanding business leaders. The luncheon takes place on April 19th from 11AM-1PM during the St. Louis Business Expo at the St. Charles Convention Center. The “Top 100 People To Know Luncheon” annually honors the area’s “Top 100 People To Know in St. Louis to Succeed In Business” as voted on by a group of selected judges. The luncheon will feature the highly regarded Speaker and Performance Coach Ben Newman, with honorees awarded before a group of outstanding business leaders. The luncheon takes place on April 19th from 11AM-1PM during the St. Louis Business Expo at the St. Charles Convention Center. 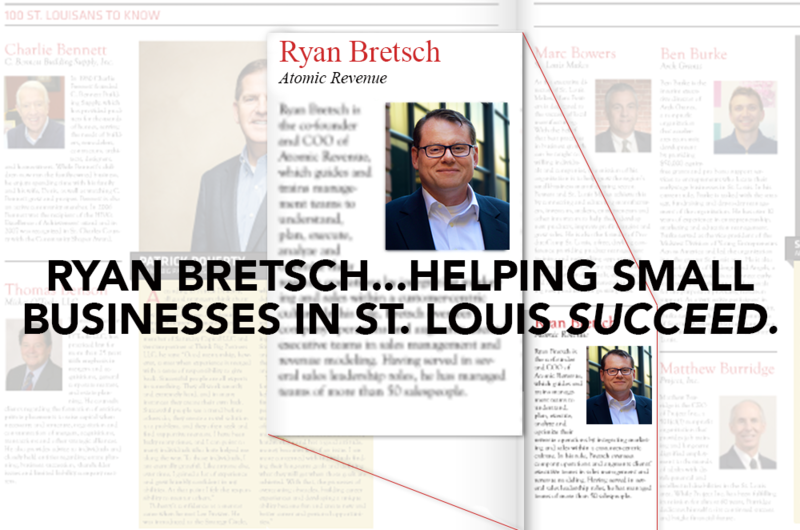 Ryan Bretsch is the Co-Founder and COO of Atomic Revenue, overseeing company operations and augmenting clients’ executive teams in Sales Management and Revenue Modeling. Having served in several sales leadership roles, he has managed teams of more than 50 salespeople, repeatedly achieving the #1 spot in both performance and client satisfaction.